Current Culture High Performance Deep Water Culture - The Proven Production System. 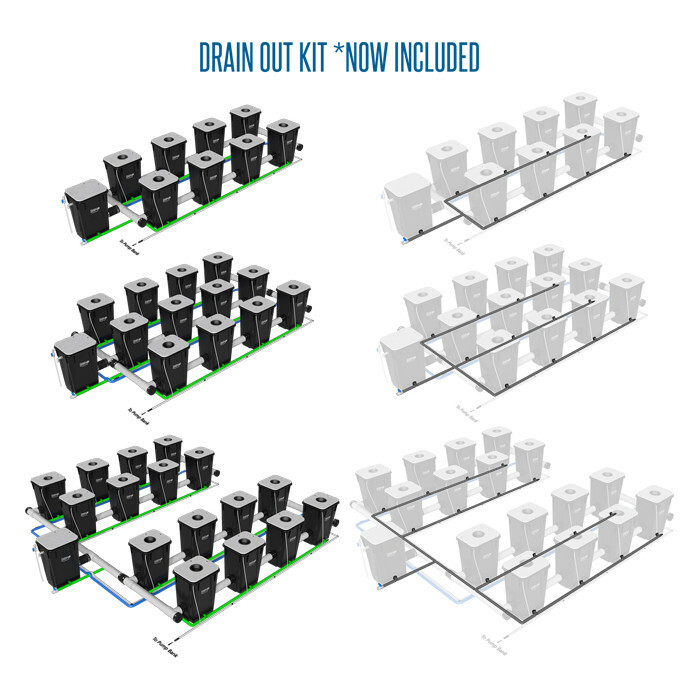 Now with Included Drain Out Kit! 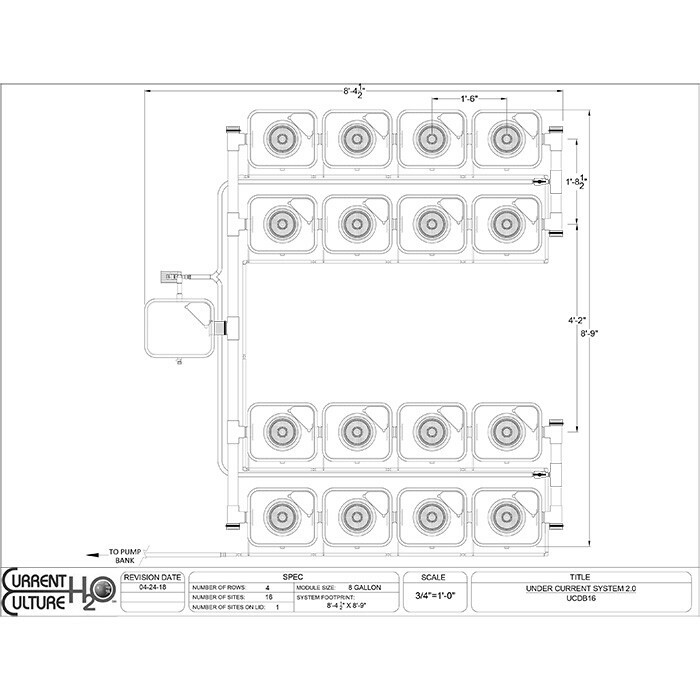 Current Cultures' UCDB 16 is perfect for the grower that is looking for a 16-site deep water culture hydroponic system. 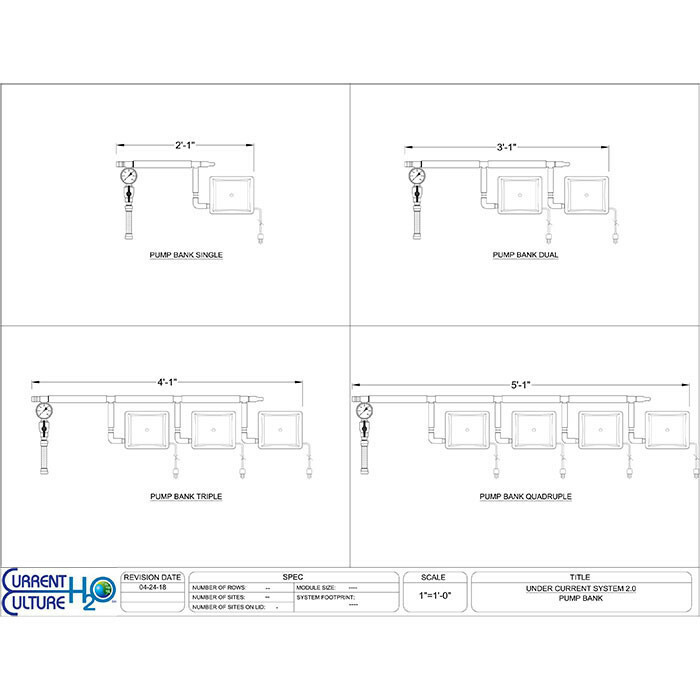 With different growth module sizes, plant spacing, and lid options the under current can be configured in a number of ways. Depending on your configurations the UCDB 16 will have a footprint between 8ft 9in x 8ft 4.5in and 12ft 10in x 14ft 2.5in, and a total system volume of 117 gallons to 200 gallons. See our Add On Components for important tools that will maximize your garden's production and ensure its health. If you have any questions about this system give us a call and one of our experienced growers will answer all of your questions. The Under Current® features the patented Sub-Current Culture® circulation method. This high-performance water culture system is unmatched in efficiency, layout versatility and ease of use. The Under Current® utilizes negative water pressure to recirculate oxygenated nutrient solution through the plant’s root zone ensuring pH and EC levels are uniform throughout the entire system. The Under Current® is the cornerstone of the CCH2O Proven Production Approach when used with Cultured Solutions® Nutrients and the CCH2O Nutrient Dosing System. What is the Under Current® System? 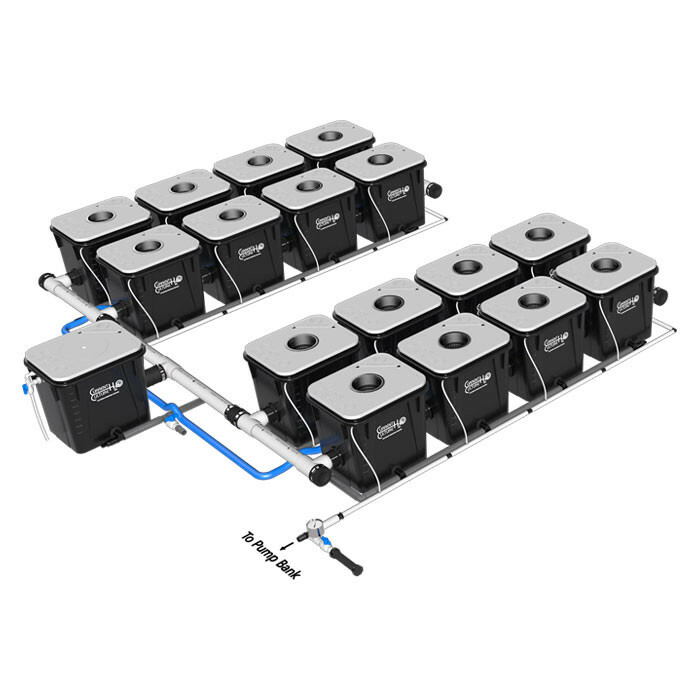 The Under Current® system is the world’s only recirculating water culture hydroponic system to feature the patented Sub-Current Culture® circulation method. Sub-Current Culture® (SCC) technology utilizes negative water pressure to recirculate highly oxygenated nutrient solution through the plant’s root zone. This continuous fluid motion supercharges the nutrients with dissolved oxygen, creating hyper-aerobic conditions perfect for explosive plant growth. Constant 24/7 nutrient circulation ensures pH and EC levels are uniform throughout the entire system. This unique water culture application is unprecedented in layout versatility and ease of use. The Under Current® consistently delivers awe-inspiring yields for any sized application, from hobby to commercial greenhouse. Yield more with less. Reduce plant counts. More production per plant. Accelerated growth rates. Cut veg times. Heavy Yields = Heavy Profits. Easy and reliable. No timers, no guesswork. Reduced labor and maintenance. Want to learn to grow like a pro in the Under Current® system? Take a look at our Current Culture™ Grower's Guide for step by step instructions and tips. These important tools will maximize your garden's production. Suggested products listed as add-ons at top of product page above. Water quality is of the utmost importance when growing in water culture. RO water allows growers to control all minerals and nutrients their plant's uptake. A reverse osmosis water filter is recommended for source waters exceeding 100 ppm. The highest levels of dissolved oxygen are only accessible with cool root zone temperatures. High water temperatures limit the solutions ability to hold dissolved oxygen, while also providing the ideal environment for dangerous pathogens. 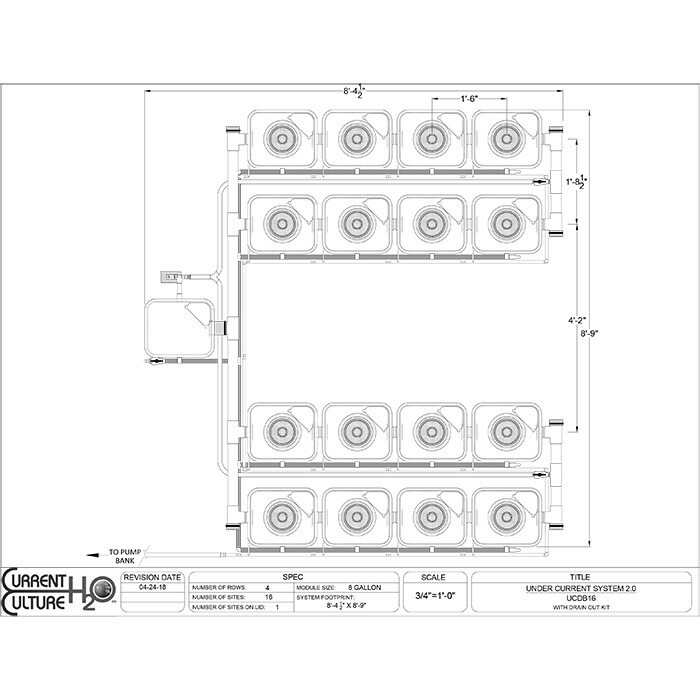 Water chillers ensure cool, consistent solution temperatures are provided to the root zone. Utilizing metering equipment in your garden will offer precise monitoring over essential environmental factors such as pH, ppm/EC, temperature and humidity. When used in conjunction with dosing and controlling equipment, the Under Current has the potential to be completely automated. Using a top-off reservoir will maintain accurate and essential solution levels throughout the course of the growing cycle, ensuring plants stay hydrated. Under Current Solo systems are single buckets that come in 8, 13 or 35 gallon growth modules. Under Current Standard systems have 2 rows of 8 or 13 gallon growth modules. Under Current Evolution systems have 3 rows of 8 or 13 gallon growth modules. Under Current Double Barrel systems have 4 rows of 8 or 13 gallon growth modules. Under Current PRO systems have a variable number of rows and 35 gallon growth modules. Under Current Boneless systems ship WITHOUT straight sections of piping allowing for custom plant spacing. Have questions? Please give us a call and one of our knowledgeable tech specialists will be ready and able to answer them all! What are the most common mistakes made in water culture? a. Running nutrient strength too high. This can inhibit water uptake and contribute to metabolic stagnation and subsequent plant stress. b. Using incompatible inputs in solution causing convolution of the water chemistry. Avoiding organic, low solubility inputs is strongly recommended. c. Micromanaging pH. Adjusting pH too frequently can lead to nutrient solution instability and issues. What makes the Under Current a more efficient hydroponic method? Less frequent nutrient change outs, lower nutrient usage rates, less pH fluctuations (less pH adjusters needed) and the conservation of precious H2O. What makes the Under Current more productive compared to other hydroponic systems? When a water culture system is operated properly, plants benefit from an increased uptake of water and minerals in solution as well as sustained cell turgidity. Given the favorable CEC of water, a plants nutrient uptake efficiency in water culture is very high, resulting in superior results. What is the approximate volume of solution in each module during standard operation? How do I calculate my total system volume? a. Multiple total number of modules plus 1 (for Epicenter) multiplied by the approximate volume per module. Take this volume and add 10% to account for solution in joints and manifolds. Can I integrate a nutrient auto dosing system? What is a top-off reservoir and why do I need one? A top-off reservoir is used to maintain consistent system volume and water chemistry. The top-off reservoir will supply solution via gravity to the float valve in Epicenter (control module). Do I need a water chiller? Do I need a Bulkhead Filter for each growth module? Is there an option for custom system spacing? Yes, all systems are available in a “Boneless” configuration without straight sections of pipe, allowing you to customize your plant centers. Does a "Boneless" system include instructions on how to cut/couple pipe? Yes, each “Boneless” kit includes a Boneless cut chart and recommendations for gluing and assembly. 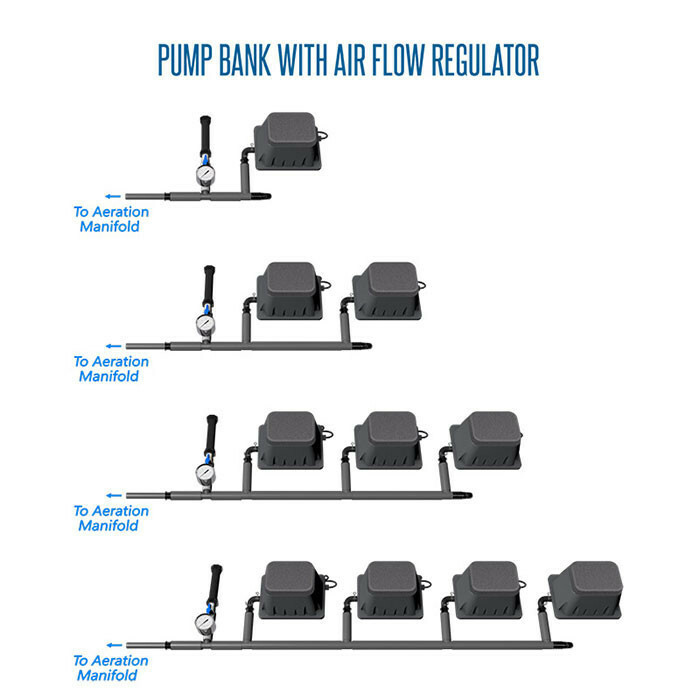 Should the Air Pump and Water Pump run 24/7? Where should I set my solution level? a. Initial Transplant: See diagram. b. Veg: 2” above base of net pot. What should be in my top-off reservoir? When operated properly, top off should be balanced the same or slightly higher as the solution in the system. Does a top-off reservoir help maintain water chemistry (pH/EC) stability? Yes. Any fluctuations in pH/EC can have a negative effect on plant health. How do I adjust pH? a. CAUTION: Do NOT add pH concentrate directly to Epicenter (control module). b. If the pH is between 5.5-6.5 no adjustment is necessary. c. Dilute pH adjuster 1:128 (about 1 oz. adjuster per gallon of fresh water). Once diluted slowly add to the system, allow 20-30 minutes for mixing. Re-test once pH has stabilized, add more diluted adjuster as necessary. What solution temperatures are optimal? We recommend maintaining a water temperature between 65-68 degrees F.
Do I need to include the initial PPM of my source-water when calculating nutrient levels? Do I have to empty out the entire system to do a nutrient change-out? What do I use to clean the system? Mix Ratio of Cleaning Agent? Physan 20, follow manufacturer’s directions. How do you veg for the system? a. Under Current system (8 gallons): Bare root or cube (rock wool, oasis, etc) propagated plants can be placed directly into our CCH2O Net Pot and placed directly into a Under Current system for optimum growth. This technique is perfect if subsequently transplanting into a larger Under Current system (13 gallon or 35 gallon PRO) at a wider plant spacing. i. In this case, the entire CCH2O Lid (with Net Pot) can be picked up and moved directly to another Under Current growth module for flowering. This method is ideal for avoiding unnecessary root damage during transplant into bloom. b. Ebb and Flow table (Periodic Flood): Bare root or cube (rock wool, oasis, etc) propagated plants can be placed directly into our CCH2O Net Pot or 4″/6″ rock wool cubes and placed in a typical tray. Some natural root pruning may occur as the roots grow through the net pot due to the intermittent watering cycle. c. Ebb and Flow Table (Continuous Flood): Bare root or cube (rock wool, oasis, etc) propagated plants can be placed directly into our CCH2O Net Pot or 4″/6″ rock wool cubes and placed in a typical tray. Adding air diffuser to the tray will create a water culture environment. This will stimulate root growth similar to the Under Current system and prepare the plants for a fairly seamless transition. d. Drip: Bare root or cube (rock wool, oasis, etc) propagated plants can be placed directly into our CCH2O Net Pot or 4″/6″ rock wool cubes. A drip system with emitters in each net pot/cube can be placed on a bench or in a flood tray. Some natural root pruning may occur as the roots grow through the RW cube. What grow mediums are recommended for use in the Under Current? a. Any non-wicking inert grow media tends to work best. Expanded clay pellets and growstones are some of the most popular. b. When using a wicking media like rockwool be sure to adjust solution level to ¼” below contact with the R.W. What is the best nutrient for the Under Current? Pure mineral-salt based nutrients like Current Culture’s Cultured Solutions are the most compatible with actively aerated water culture. What is the recommended nutrient strength for the Under Current? Are carbohydrates/sweeteners, enzymes and beneficial bacteria recommended in the Under Current? No. These tend to create bio-films and de-stabilize water chemistry. Should I use Ca/Mg in the Under Current? When using Reverse Osmosis (RO) or De-Ionized (DI) water Calcium Magnesium is recommended at 0.25-1mL per gallon. The Cultured Solution’s Coco Cal Supplement is your best choice. Should I change my nutrient strength each week? Follow manufacture’s nutrient schedule as recommended. How frequently should I change my nutrients? Change outs are recommended every 7 to 14 days, or if pH becomes de-stabilized (drifts more than 0.3 per day). Do I need to flush my system between change-outs? No, assuming only compatible inputs are being used a simple drain and refill is sufficient. Is it possible to over-aerate my Under Current? Yes, we recommend aeration levels stay between 0.75-1.5 liters per minute/per gallon. Exceeding these levels may cause mineral precipitation and nutrient de-stabilization. What should I do if I make a mistake? Observations and slight adjustments are the best way to dial your system in when in doubt give us or CCH2O a call.